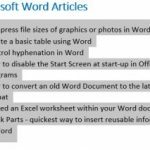 The Training Lady - Tips and Tricks for using Microsoft Office and Windows. 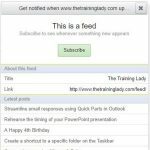 I am often asked during Outlook and WordPress training courses to explain what an RSS Feed is and does. 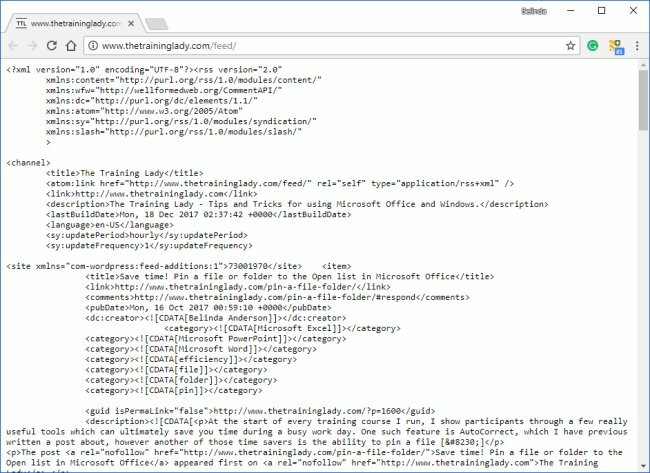 In this post, I hope to give people insight into RSS and how you can use this to receive updates on your favourite websites, straight into Microsoft Outlook. RSS stands for Rich Site Summary and provides you with a method to receive updates when your favourite site or blog is updated. 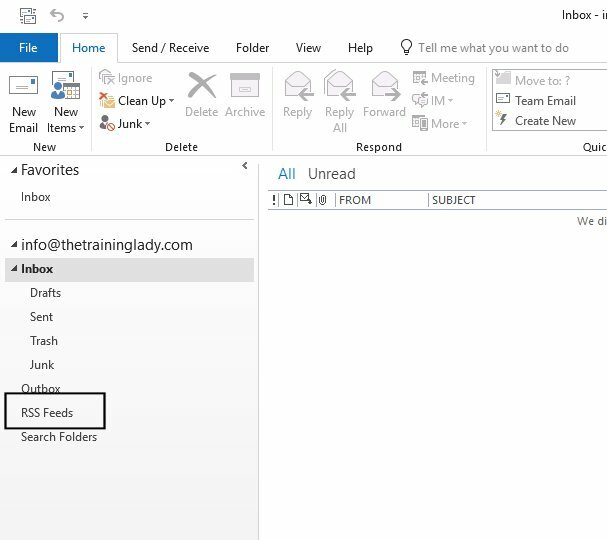 Many users of Outlook simply do not utilise the RSS capabilities even though it is a simple and effective way of finding out when a website has been updated. Gone are the days when you need to check multiple websites on a regular basis to see if anything has been added or changed. Let RSS notify you when an update has been made and all from one convenient location within Microsoft Outlook. Many websites incorporate an RSS feed facility so it makes keeping up to date much easier. Popular sites such as news, current affairs, and sport, weather, and special interest sites just like this blog, can all be set up within Outlook so that any changes are brought straight to you. In order to receive an RSS update, you need to use an RSS reader, in this case, we are going to utilise the built-in RSS Feed reading capabilities of Microsoft Outlook. For those not using Microsoft Outlook, there are many other RSS Readers available which are accessible via Android, iOS or your web browser. A quick Google search will provide you with many options. Now that you have an introduction to RSS you will now need to know how to identify if a website has an RSS feed available. 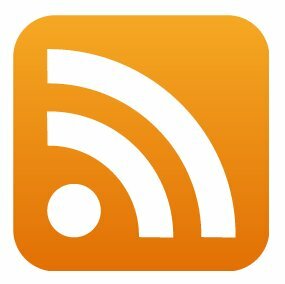 The most common method to identify if an RSS feed is available is to look for the RSS icon on the site as shown below. Some sites feature the icon along with links to other social media options or can have the icon displayed at the top or bottom of the page. Have a look around and see if you can spot the icon. a) Mozilla Firefox (I’m using v57.0.5): From the Bookmarks Toolbar select the Subscribe button. If the Subscribe button is not displayed simply click Menu button (≡) and choose Customize then drag and drop it into the Bookmarks Toolbar area then click Done. Once you click Subscribe you will see a list of available RSS feeds, if any, from the page you are viewing. Select the one you want to view. 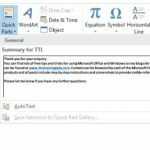 The RSS feed will be displayed, copy the URL to set up the feed in Microsoft Outlook. If the Subscribe button is greyed out then there is no RSS feed available on the site you are viewing. b) Google Chrome (I’m using v63): You will need to install an RSS Feed Reader which adds an RSS Feed button to the Address toolbar for easy subscription. 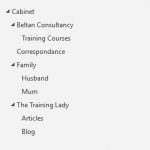 When the RSS Feed button appears on the address bar simply click the button to view a drop-down list of available RSS feeds. I hope you have found this post useful. Be sure to check out other posts such as My Favourite Shortcut Keys in Outlook. Join our other Facebook Devoted Fans!